Employers boosted payrolls by a respectable 132,000 in November, but the unemployment rate edged up to 4.5 percent as jobseekers streamed into the labor market by the thousands with the onrushing holidays. The tally of new jobs added to the economy last month marked an improvement from the 79,000 new positions generated in October and was the most since September, the Labor Department reported Friday. It was mostly a cheerful economic message at a time of year when shopping peaks. "The unemployment rate did notch up to 4.5 percent, but in the grand historical scheme of things 4.5 percent is still very, very low unemployment," Mark Zandi, chief economist of Moody's Economy.com, told CBS Radio News. More than two decades ago, for example, civilian unemployment went over 10 percent during the President Reagan's first term in the early 1980s. Thousands of people — encouraged by brightening job prospects — poured into the labor market looking for work last month, a factor that played a role in pushing the overall civilian unemployment up. "It was a strong report, a sturdy report, 130,000-plus jobs means that the economy is absorbing all those folks that are out there looking for work," Zandi said. The politically sensitive number also pointed to a labor market that is in good shape despite a slumping housing market and a struggling auto sector. "It's a bit surprising that we haven't seen more of a slowdown in the job market, particularly under the weight of a correcting housing market and cuts in the vehicle industry. I would have anticipated a more measurable slowing in activity in the job market. Haven't seen it yet," Zandi said. The increase in payrolls was stronger than the 105,000 jobs that economists were expecting. Analysts were anticipating a rise in the jobless rate, however. Workers, many of whom have seen their wages whittled by inflation, saw wages grow modestly last month. Average hourly earnings rose to $16.94, a 0.2 percent increase from the prior month. 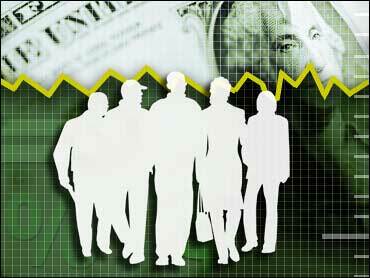 Economists were forecasting a slightly bigger rise of 0.3 percent. Over the last 12 months, wages grew by a strong 4.1 percent. Growth in wages should support consumer spending — the habit that helps keep the economy afloat. But a rapid and sustained advanced — if not blunted by other economic forces — can raise inflation concerns. That's not good for the economy or workers' pocketbooks because inflation can eat into everybody's buying power. Federal Reserve Chairman Ben Bernanke said the central bank is keeping a close watch on wages for any signs of inflation. The Bush administration insists the economy is fundamentally sound and Americans for the most part are faring well. But Democrats say that the middle class and others have benefited little from the economic expansion over the last five years. A top priority for the Democratic-controlled Congress, which convenes in January, will be raising the federal minimum wage from $5.15 an hour to $7.25 an hour. That wage has not been increased for nearly 10 years. Americans' are giving President Bush lower marks for his economic stewardship. The president's approval rating on the economy sank to 38 percent in December, down from 43 percent in November, according to an AP-Ipsos poll. "We are seeing layoffs in construction trades, in almost all of manufacturing. We are seeing job creation in health care. We saw a little bit of job creation in retail, financial services, said Moody's Economy.com's Zandi. "So the service side of the economy continues to generate lots of jobs." The job cuts in construction and manufacturing partly reflect the woes of the housing and auto sectors. Construction companies cut 29,000 positions last month, while factories shed 15,000. Retailers — bulking up for the holiday season — added more than 20,000 new jobs. Education and health services increased employment by 41,000 and financial services added 11,000 slots. Leisure and hospitality boosted jobs by 31,000 and the government by 18,000. Overall job gains turned out to be slightly lower in October than first reported, while gains for September were higher. The job hunt got a little shorter in November. The average time that unemployed people spent in their job searches was 16.4 weeks, down from 16.5 week in October. The economy, which has been losing steam all this year, slowed to a pace of 2.2 percent in the July-to-September quarter. Growth in the October-to-December quarter and into early next year also is expected to be sluggish. The crumbling housing market is a main factor in the economy's slower growth. Still, Bernanke recently gave a mostly positive assessment of the economy's growth prospects and the job market- indicating that the housing slump won't drag the economy into recession. Against this backdrop, the Federal Reserve, which had been steadily boosting interest rates for two years to thwart inflation, has left them alone since August. Many economists predict the Fed will keep its finger on the interest-rate pause button when its meets next Tuesday for its last session of the year. Wall Street is predicting that the Fed's next rate move in 2007 will be a rate cut. But Bernanke, in his recent remarks, gave no hint that would be the case.